Brimming with the opulence of Seven Sisters Peak is certainly bliss to the tourist's eyes. 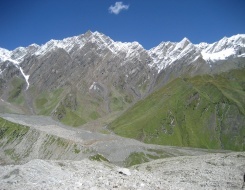 The snow-covered peak blessed with serene and fascinating ambiance creates a unique charm that remains stored in the minds of the tourists forever. Climbing the Seven Sisters Peak of Manali renders exhilaration to the traveler that is certainly second to none. For climbing this peak, a traveler has to trek Dhundi, which is a 6 kilometers of walk. Later, the tourists can attempt to climb this imposing snowy peak. The tour becomes even more heartwarming when exploring Solang Valley is added in the itinerary. This 07 nights and 08 days itinerary incorporates climbing to Seven Sisters Peak of Manali along with exploring Solang Valley and trekking to Dhundi. The tour is perfect for adventure enthusiasts with fervor to get drenched into nature's pulchritude. Height: 15000 ft to 16250ft. In the evening board AC Volvo coach for Manali at 18:00 hrs. Overnight journey. Arrival at Manali by morning in between 06:00 hrs – 07:00 hrs. On arrival meet our executive and transfer to hotel for relax & acclimatisation. After leisure visit Hadimba Devi temple, old Manali and the Mall road. Overnight stay at the hotel. Today, we will trek from Solang to Dhundi, which is about 6 km walk. On the way, we will witness many beautiful views of the real natural beauty. Later return back to the hotel for dinner followed by an overnight stay. The day is free for leisure wherein you can rest in the hotel and spend some quality time while admiring the real natural beauty. The next two days are fixed for attempting to reach the Summit and enjoy an overnight stay in camps/tents. In the morning after breakfast, we will leave from the Summit to return back to Solang Nala and from here drive to Manali. Enjoy a night stay at the hotel in Manali. The day is for last minute shopping or relax. In the late afternoon transfer to Volvo station and from here we will drive to Delhi at 16:30 hrs. Overnight journey. Arrival at Delhi by morning in between 07:00 am – 08:00 am. End of the tour and services.